If you haven't been following this series, I'm trying to break my habit of eating out at lunch for no good reason. Each day I bring my lunch gives me $5.00 to invest in stock with Loyal3, an online commission-free broker. This week should remind me to meal plan. Tuesday I had an errand to run at lunchtime and drove through a favorite fast food place; by Friday I was sick of grilled cheese sandwiches and there was nothing else in the fridge. This week I got $15.00 to invest. Retire Before Dad has a list of Loyal3 stocks (they sell a very limited number) and has set up a constantly updated spreadsheet that rates them. You can see the chart and methodology here. When I looked at it, Best Buy was number 1 and Intel was number 2. For some reason, I'm nervous about Best Buy; I'm just not convinced they are going to be around long-term. It's a gut feeling, not an educated point of view. In any case, I didn't want to buy Best Buy, so I bought Intel. Off to plan some yummy lunches so when my husband buys groceries tomorrow he gets what I need so I can skip the overprice mediocre food at the building lunch counter and buy stock instead. Many families want to know how to save money on healthcare. While it is a major portion of many family budgets, there are ways to, if not save money, at least get the most for it. If someone in your family gets sick enough to reach the maximum deductible/co-pay on the policy. Often, for the same network of doctors, the high-deductible plans are cheaper in all three cases; however, if someone else (like your employer or the government) is subsidizing the plan, that may not be true. The only way to find out for sure which is best to save money on healthcare is to run the numbers. Even after you run the numbers, be honest with yourself. If the high deductible plan would be cheaper, would you put the premium savings in an HSA for healthcare expenses, or would you spend it? If spending it is likely, what would you do if you incurred a large medical expense? Even if you would save the premium savings, what would happen if someone in your family incurred major expenses next week? Also, you may be asked to choose between plans with various networks, network benefits and out-of-network benefits. Some plans require that care be coordinated through a primary care physician; others do not. In short, generally the more limited your choices, the lower your cost, if you follow the rules. However, those limited networks may not include the doctors you want to use or, if the doctors are included, they may have few slots available for patients with that insurance. If you are contemplating switching insurance, particularly if that switch will require you to switch doctors, call the preferred new doctor's office and ask for an appointment for a check-up, and when they ask about your insurance, tell them you have the plan you are contemplating. If it will be a while before that doctor can see you, tell the appointment clerk that you do not yet have that insurance, but are considering it. If you need ongoing care, tell her why (eg. I take blood pressure medication) and that you are considering switching insurance and switching to Dr. X as your primary care physician. Ask how soon after the insurance takes effect you would be able to see Dr. X, and if it isn't soon enough, consider another choice. If you do not need ongoing care, tell the clerk that you are considering switching to that insurance and to Dr. X as your primary care physician, and ask what you should do if you develop an acute illness before you are able to be seen for a check-up. The answer to that question should be part of your choice. If you are going to end up in the emergency room because the doctor won't/can't see you, and the insurance is going to deny your claim because your sore throat should not have made you fear loss of life or limb, then the low premium isn't much consolation. What happens if you go to an out-of-network doctor? What happens if you go to the emergency room for what is deemed a non-emergency? What happens if you self-refer to a specialist? How much will your prescription cost? Those are all questions to consider both when selecting a policy and when seeking healthcare. If you choose to pay an out-of-network provider, and that provider prescribes medicine, is the medicine covered? Which hospital are you supposed to use? Do you have to try a generic drug first, before a brand name? You will not save money on healthcare if you do not follow the terms of your policy. 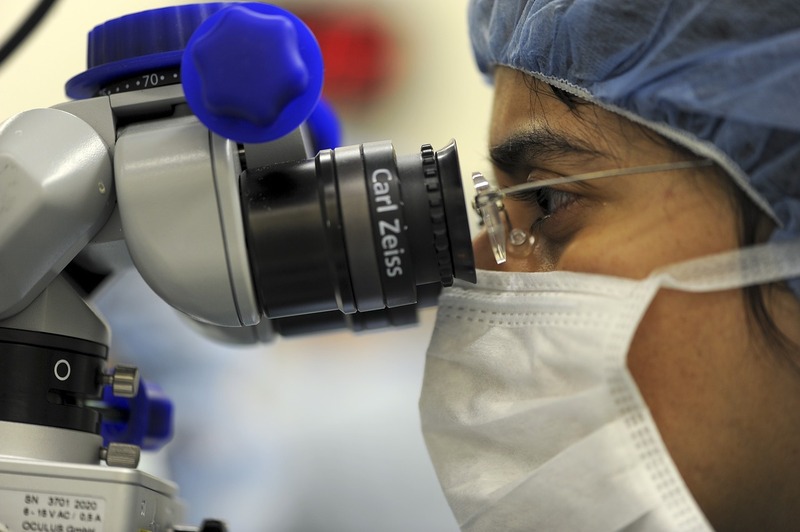 Flexible Spending Accounts are a way many employers help employees save money on healthcare. Flexible Spending Accounts allow employees to choose to have up to $2550.00 per year withheld from their paychecks and placed into an account that can only be used for healthcare expenses. Insurance co-pays and deductibles are eligible expenses, as are prescription drugs, out-of-network doctors, dental or orthodontic care and even some over-the-counter drugs. The advantage of an FSA account is that the money is withheld pre-tax. If you use after-tax dollars to pay those expenses, you can only deduct those expenses that exceed 10% of your adjusted gross income; with the FSA, all the expenses are, in effect, deductible. Also, your employer may allow you to spend the money before it is deducted from your check so that a root canal in January can be paid for from the plan in January, and basically financed for the rest of the year. The downside of an FSA is that if you don't use it, you lose it, though employers can allow you to carry forward a small amount. People whose health insurance deductible (the amount they pay before the policy pays anything) exceeds $1,300 per person/$2,600 per family qualify for a Health Savings Account. Some employers offer them; if yours does not, your bank probably does. You receive a tax deduction for money deposited into the account, and you do not pay taxes on money that is withdrawn, as long as you use it to pay healthcare expenses. 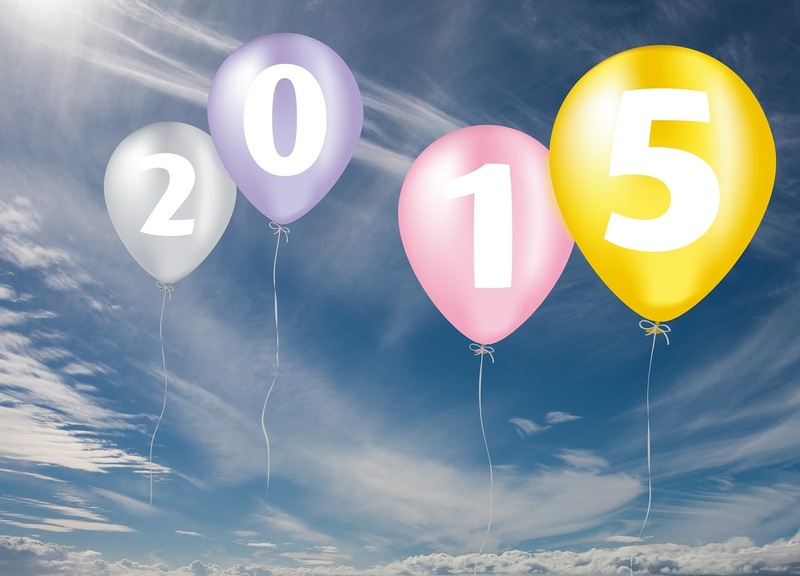 You can carry over the account from year to year. One tactic people use is to choose a high-deductible plan and then put the difference between the premiums for the high -deductible and low-deductible plans in an HSA. As long as you do not have major claims, after a few years there will be more than enough in that account to pay the deductibles. The purpose of insurance is to protect you against things you cannot afford to have happen. If you are going to pay money for premiums, you want to buy insurance that makes a difference if it is needed. There are many "supplemental" insurance plans offered by companies like AFLAC or sold via newspaper ads that pay if you get cancer, if you are in an accident, if you are hospitalized, or if some specified disease occurs. While the low premiums are the selling point for these policies, the possible payouts are also relatively low, and in the grand scheme of things, for many people, are unlikely to make much of a difference in your life. Sit down and run the numbers. How many months would you have to pay premiums before your benefit would equal what you paid? How much difference would that check make if the bad thing happened? Is there a period of time during which the policy will only return the premiums paid, rather than paying the face value? Remember you are betting against an insurance company that knows the odds. Face it, emergency rooms are expensive. Unless you have no other choice, don't go there. While choices may be limited in rural areas or small towns, larger cities have other options including drugstore minute clinics and urgent care clinics. Unless you suspect broken bones, major trauma or serious illness, try the minute clinic or urgent care if your doctor can't see you. Also, your primary care physician is often the least expensive person to see about an illness. Yes, it is possible that s/he will refer you to a specialist, so that you will get two bills instead of the one you would have gotten had you gone straight to the specialist, but the reality is that most problems can be handled by an internist, family medicine doctor or pediatrician. Medical bills are pages and pages long and include procedure codes, diagnosis codes and charges upon charges. Make sure you or your loved one got what you were billed for. My husband received two bills for his colonoscopy one year. As he said "I may be an A----but I don't have two of them". 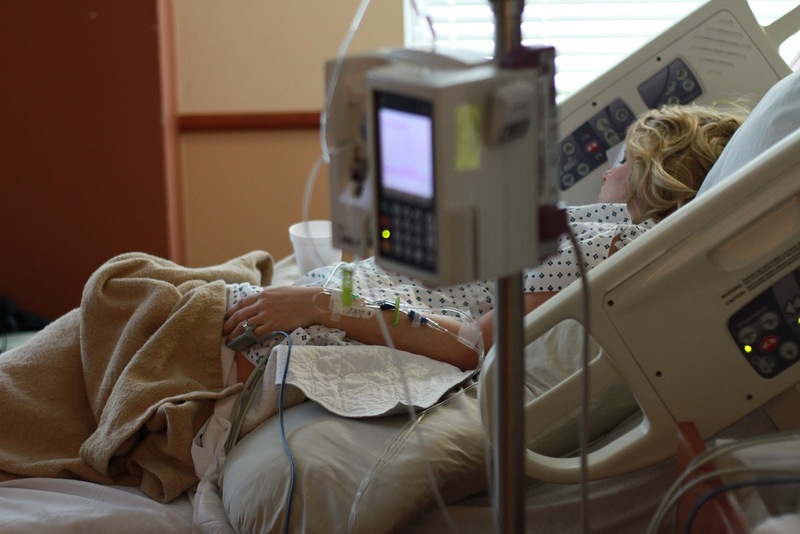 Some healthcare problems are unavoidable; however many are of our own making. Eating right, maintaining a health weight and exercising regularly and avoiding stupidity behind the wheel will do as much to lower average medical bills as any fancy government program or overpriced medicine. Healthcare is expensive. We all know it. There are no magic bullets that allow us cheap healthcare; however, becoming better consumers can help save money on healthcare. Do you have any advice for those struggling to pay for healthcare? This week my Kickfurther Merchant of the Week is The Mulberry Silk Company which is owned and run by Martin Chesno, and Martin is visiting with us this week. Kickfurther, for those of you new to this blog, is an investment platform via which investors fund inventory for businesses. As the inventory sells, the company repays the investors and gives them an agreed-upon return. Mulberry Silk Company is one of the businesses financing inventory on Kickfurther and I am one of the investors who financed their inventory. Q: Martin, can you tell us a little about yourself? A: I have experience in working with 'big' business in the FMCG space in Southern Africa. This included being a brand manager for Procter & Gamble, SC Johnsons Wax and other smaller brands in Zimbabwe. Later as an entrepreneur in South Africa I have dealt with most major retailers offering different products into the FMCG market. Q: Can you tell me a little about your company?Where are you located, when did you start? A: I have manufacturing under control by my long time friend and partner. He is based in China and assisted in establishing the brand from the outset. We have warehousing and offices in Chicago, Illinois but I reside primarily in Cape Town, South Africa - so we work out of both places. We started as traditional importers and distributors in 2005 and then in 2010 we took the business online. We sell on our own website as well as on Amazon . Now some of our products are available in the Kickfurther Store as well. Q: You sell silk bedding, sheets, pillows and comforters. What parts are made of silk? A: We specialize in Comforters which are filled with the finest quality Mulberry Silk. Our pillows too are filled with Mulberry Silk (although we do offer an alternative Silk mix to give the pillow some loft). 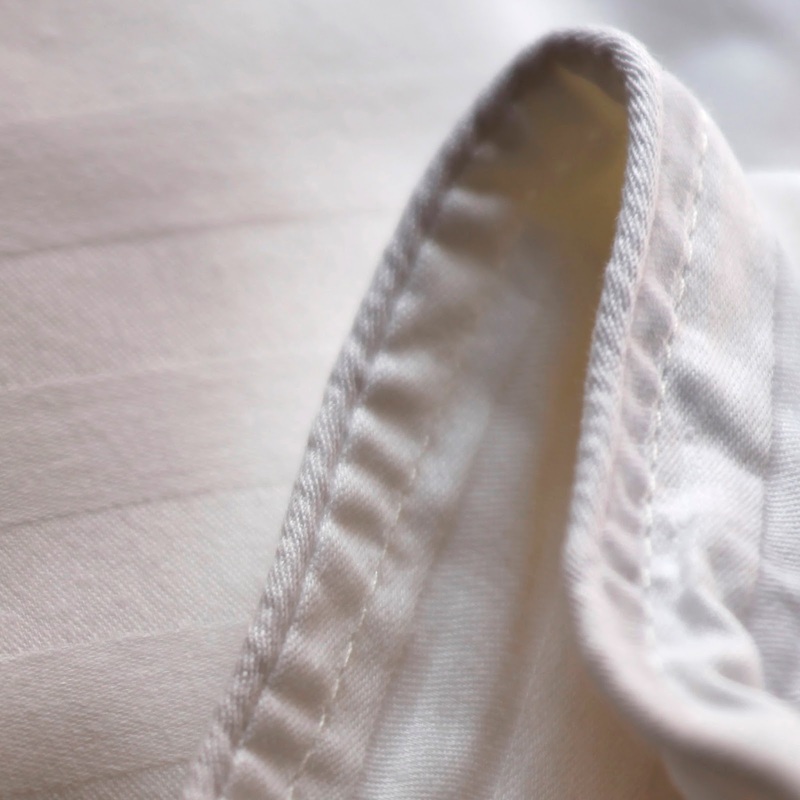 As an add-on service we offer the rest of the linen for your bed, Our sheets, comforter covers, and pillow cases are pure silk and hand made in Vietnam. Q: How long can I realistically expect a silk comforter to last? A: Wow, a life time (and no reason why not, if looked after properly - but to be safe we say at least 5 years). Q: What are the advantages of silk comforters? A: Silk Comforters are hypo-allergenic and do not trigger feather-related allergic reactions. Mulberry Silk comforters are lightweight, supple and compact. They are easy to store, move, and dry clean. Our silk comforters keep you dry as the hygroscopic silk fiber absorbs one third its own weight in moisture without feeling damp. Silk provides thermal balance for luxurious warmth in the winter, and is super-lightweight and breathable for the summer. The silk fibres inside your Mulberry Silk Comforter act as a repellent to dust mites and bugs since they are deprived of the moist environment they require for their survival. Q: All the bedding I see on your website is white. Why is that? Do you have any plans to expand into colored bedding? A: From our side we want to keep things simple. The Comforters come in a 300 Thread Count Cotton outer - these look and feel beautiful - but one still has the option to purchase a cover in the color of their choice. Covering your Comforter will help protect it from unnecessary spills. Q: How did you first hear about Kickfurther? A: I was looking at funding through Kickstarter and came across Kickfurther! 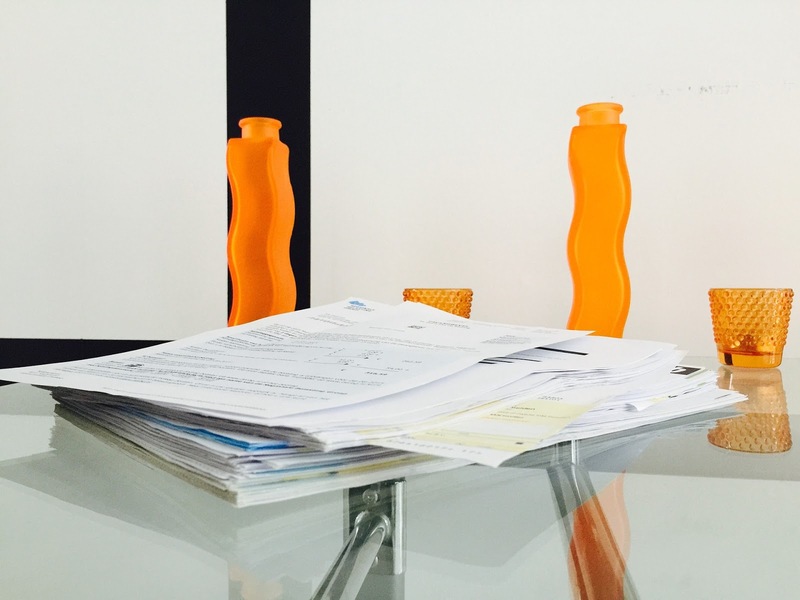 Q: You've completed one Kickfurther offer and are in the payback phase of your second offer. From a merchant's point of view, what are the advantages and disadvantages of Kickfurther financing vs conventional financing? A: I honestly cannot see any disadvantages. You are held accountable to your backers - and this personal relationship with these people supporting you, is an amazing thing. Q: Would you recommend Kickfurther to other businesses? Why or why not? A: Absolutely would, without any hesitation. Q: Have you tried Kickfuther as an investor? Why or why not? Would your recommend that friends invest via Kickfurther? A: Yes, I would. I have not tried as an investor - would be great if one could pay via Paypal! I'd like to thank Martin for being with us here today. If you would like to purchase a silk comforter, you can do so at his website, on Amazon , or in the Kickfurther Store. If you would like a 10% discount off thier Full / Queen size Comforter (92 x 96" ), leave a comment with your contact information (if you profile gives contact info, that's enough) and I'll forward you name on to Martin. If you would like to invest by purchasing inventory for businesses like The Mulberry Silk Company, you can use my link and get five dollars toward your first investment. If you are a business owner looking for financing, use this link to learn about Kickfurther. If you haven't been following this series, I'm trying to break my habit of eating out at lunch for no good reason. Each day I bring my lunch gives me $5.00 to invest in stock with Loyal3, an online commission-free broker. This report is covering two weeks, since I didn't write one last week. Last week we didn't have much in the fridge at home as far as leftovers, and I was in a hurry, etc. In any case, I only brought my lunch three times. This week was better; I brought lunch every day. The market has taken a beating lately. Last week I decided that I had good reasons for liking all the companies in which I had already invested; therefore I put more money into the one that had dropped the most from the time I bought it, Disney. This week I looked at how my stocks had done since the beginning of last year, and bought the one that had dropped the biggest percentage, VF Corporation. Like the vast majority of people, I lost money this week. You can see my whole Loyal3 Lunch portfolio by clinking the link at the top of the page. You note the highly technical analysis of why I pick these stocks. I've been reading a bunch of investor blogs trying to get a handle on the lingo, and figure out what I should be looking for in all those numbers. However, for me, this portfolio is a toy; instead of buying shoes I don't need I buy stock I don't need (and which I hope makes money for me). I do not recommend that anyone use such an approach when investing large sums of money (whatever "large" is to you). Those of you who follow this blog know that I invest via Kickfurther, which is a platform that crowdfunds inventory for businesses. My first investment was in April, 2015, so I thought it was time for a review of Kickfurther. The concept of Kickfurther is simple. In order to sell merchandise, businesses have to buy it--whether by purchasing a finished product from manufacturers or by purchasing raw materials to fashion into a finished product. Many businesses, particularly newer, smaller businesses have difficulty obtaining credit from banks or other traditional forms of financing and so are unable to grow as quickly as the market might otherwise allow. Rather than examining the creditworthiness of the business as a whole, Kickfurther concerns itself with inventory and whether the business has shown it can sell it. Rather than lending businesses money with which to purchase inventory, Kickfurther purchases the inventory for them, and then gives it back to the business to sell on consignment. As the inventory is sold, investors received an agreed-upon return. Theoretically, since the inventory is the property of the Kickfurther backers, if the business itself fails, or if the inventory fails to sell, Kickfurther, on behalf of the backers, can repossess the inventory and recoup at least some of the investors' money. The earliest offer I could find was from Marlie Madison, a Dallas boutique which raised $2977 in November, 2014, and which paid it back, with a 10% return (that's total return, not per annum) less than two months later. All total, from what I can tell, Kickfurther, as of this writing (1/19) has 122 offers which have been funded and are in the process of payback. 59 which have been paid back entirely and 1 that has been cancelled for non-payment. Of the 122 open offers, 56 have not reached the point that a payback is due; 64 have. Of those 64, 43 are paying back on time, at least so far. After I wrote those numbers, the Reddit that is run by Kickfurther had a post linking to this page which gives up-to-date numbers for Kickfurther. My Little Vixen: No payment; should be at 83%. Gemphones: Behind but paying; at 15% rather than 40%. Bellies to Babies: Behind but paying; 25% rather than 50%. Now, some of these may finish strong. I know that Kickfuther has started repossession proceedings against Thump, Chesstache, Marlie Madison, Snow Lizard, Comic Book Displays, My Little Vixen, and Kayson, besides the earlier proceeding against Max Axe Guitar. In at least some of these cases, Kickfurther has offered to pay back the principal to the investors; stating that investors shouldn't have to pay for them learning how to take possession of the inventory. Obviously that state of affairs can't continue; investors will have to bear their own losses eventually. The way Kickfurther is supposed to work is that vendors repay as they sell. If they sell the financed inventory in the first month, they are supposed to pay back all the money the first month. If sales are less than expected, payments are reduced, which is good for vendors because if the ship gets stuck in customs or the factory is behind schedule, they don't have to make a payment, or pay more interest. The advantage for investors is supposed to be that can repossess the property to get at least some of the investor's money back, no matter how badly the business does. Investors aren't creditors of the business but rather, owners of property being sold on consignment. That's the theory. What is reality? Reality is that at least four offers are at least two months behind and have paid nothing; which would lead you to believe than they have sold NONE of the inventory. Perhaps they haven't; however most of them have claimed they have sold some. My guess is that some goods were sold, and the money used to pay pressing bills. This is a problem not only because it reduces the investors' yield but also because it reduces investors to unsecured creditors of businesses that are in trouble, which needless to say, is not a good position. Right now there is only one offer that is paying ahead of schedule; the rest are either behind (not many other than those mentioned) or paying right on schedule. I find it hard to believe that all those business owners were that good at predicting sales. I find it far more likely that they are holding money, paying what is necessary to keep investors happy. From the vendor's viewpoint, it makes little sense to pay back early as it does not reduce their interest. When these deals work, the return is excellent. An average rate right now is about 10% in 6 months; usually paid in 3-4 installments. Annualized this is over 20% per year. Investors also get the pleasure of helping young businesses grow. Investors can invest as little as $20 for less than a year. At this point I have earned $78.50 in returns, plus $15.00 in bonuses. The annualized returns on all my offers that have finished have been well over 20%. However, if I had to bear my own losses, if Kickfurther had not agreed to take them over as part of their learning process, I think I would be $81.00 in the hole due to deals that I think will yield little if any recovery for Kickfurther. Of the others in my account, I have one that is two months late with the first payment and two that are substantially behind schedule. I think I'm pretty average. Of 182 funded offers, 3 appear to be total losses and others partial losses. At an average return of 10% per offer, it would take 30 good deals to wipe out the three bad, and get you back to even, or a 10/1 ratio, just to break even. 19 of the 126 offers that have reached the payback stage so far appear to have trouble. The odds aren't looking good, but the question to which no one knows the answer is how much will they end up paying back. Unfortunately for those who pay, in any financing scheme, those who pay not only have to pay enough to cover themselves, but also to cover those who don't pay. Are the good offers paying enough to make up for the bad? The jury is still out. Despite the fact that the overall numbers don't look great, individual offers have done quite well, and right now there are more investors than offers. Today an offer over $170,000 filled in less than a minute. It was the second offer for the company and they were financing inventory which had been pre-sold. In other words, unless something totally unexpected happens, there is already a buyer. The offer was for an 8.5% return over 4.5 months, one of the best recently offered rates--and I wasn't fast enough to get in on it. In my opinion, a big problem is that there is no effort by Kickfurther to rate these offers and with so many people chasing them, the offered rates are going down. However, each merchant sets their own offered rate and there seems to be no rhyme or reason to them. The offers all seem to fill quickly and I think people are going to get burned. When Prosper started, it used a model of investors bidding on the loans--the ones who bid the lowest interest got the loan. Unfortunately, the people bidding were not bankers and did not have a good handle on expected losses. They ended up, on average, losing money. Since Prosper has been setting the rates, investors who are well diversified have not lost money. Unless there is some standardization of rates on Kickfurther based on the ability of the company to repay the funds, merchants will continue to lower rates, and, as long as the rates at least appear to be better than investors can get elsewhere, investors will continue to chase those rates, until they start getting burned on defaults. Once that happens, unless the rates on the winners make up for the defaults the platform will, in my opinion, fail. Kickfurther is a place for money you can afford to lose. There are no reliable estimates of earnings or defaults. Kickfurther has talked about putting in an inventory tracking system, but that hasn't been done yet and so I question how accurately paybacks reflect sales. While reclaiming and selling unsold inventory has been touted as a feature of Kickfurther, we have no idea how successful such takeovers will be. Kickfurther is also for people who can be on the computer at 4:00 p.m. Central time, and I don't mean 4:01. Offers go live then and are generally grabbed immediately; if they aren't, they are either paying less than average or there is something about the product or company that is suspect. On the other hand, Kickfurther is a new and developing platform. They are making changes and improvements all the time. Some of them last and others (like early access to offers, and $5.00 per person referral bonuses) don't. They are working on inventory tracking systems and they are processing their first cancellation/repossessions now. They are aware of investors' concerns and say they are trying to address them. Management participates regularly in a Reddit and responds to investors' questions and comments. I'm going to continue to reinvest the money I have in Kickfurther (when I can get on the site at 4:00 p.m.) but until I see evidence that the overall return is going to be higher than what I've seen so far, I am not investing any more money. 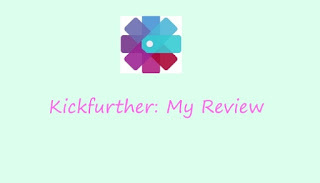 I think the Kickfurther concept is good but right now there are too many investors chasing too few offers and with Kickfurther depending on the honor system to track sales, I think the possibility of getting burned outweighs the probability of making money. I'll stick with what I have for a while, but it is money I can afford to lose. Do you invest with Kickfurther? If so are your concerns the same as mine? What has your experience been so far? This week my Kickfurther Merchant of the Week is Vaportini, and I have their business manager, Jack Faller, visiting with us today. Q: Can you tell me a little about how your company started and how it has grown over the years? A: We developed the product at the bar called Red Kiva in the west loop in Chicago. My partner Julie Palmer was the GM and I was the bar manager. Julie got the idea for the Vaportini, and the first incarnation was made with a lead base that Julie heated in an oven. Obviously for mass production this was not easy to replicate. On top of being extremely heavy it also could burn people if it was overheated. Julie tried to make other versions that were battery operated but we found that it would be too expensive, production wise. We got really lucky that a tea light candle actually worked for the temperature needed with a pint glass. That was pure luck. Our first focus was to sell to bars, and most bars in the US have their own pint glasses so that is why the basic kit went into production first. We had 200 made, which was basically every dollar we could scrape together between the two of us. We had a launch party for which we hand delivered flyers around, and around fifty people came. Luckily, one was a writer for Timeout Chicago, a small publication. He came back for a individual interview on another night. The article he wrote got picked up by the AP on January 13, 2013. Then Jimmy Kimmel, Bob and Tom, and Chelsea Lately, all mentioned it on their shows. We had around 3,000 orders the next week. At this point we retooled our manufacturing as the US manufacturers we had used for the samples were not set up to do this on a large scale. We had to switch to overseas, which took us about four months to do. We relaunched at this point and the had free media for the first two years. Some was positive and some was negative, but it all drove sales. 2016 will be the first year we do a large marketing campaign of our own. Q: What do you like to put in a Vaportini? A: My favorite things in a Vaportini are a high-end bourbon or gin. With both of these things, the Vaportini brings out the best flavors and aspects of the liquor. It is a great taste testing device for when you buy a high-end bottle and really want to savor the flavors. Then I drink some also, and try to pick out the notes of the spirit. Q: Compare drinking a shot of bourbon and putting that shot in a Vaportini in terms of how long it takes to imbibe, how long to feel the effects of the alcohol and how long those effects last. Q: To whom do you mostly sell? To bars or to individuals? A: Most of our sales have been to individuals for home use. We use bars as a promotional tool. We are trying to cultivate a high end image so those are the bars that we try to get into. We sell to the bars at a heavily discounted price, but it doesn't fit into a lot of places. As a former bar manager I know that a lot of places do not want new glassware as it is just one more thing to maintain. 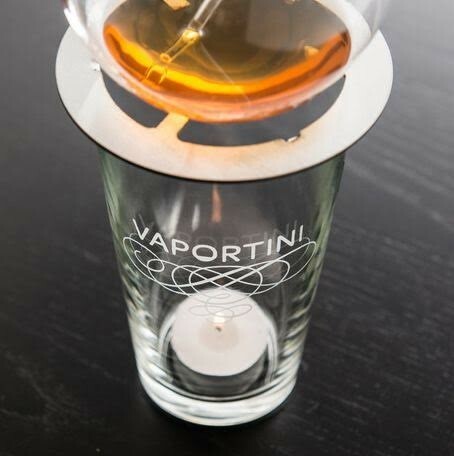 The Vaportini works well in higher end lounges, but it is hard to serve Vaportini's in dance clubs, sports bars, or anywhere that gets wall to wall busy. Q: How did you first hear about Kickfurther and why did you decide to use it? A: I believe they contacted us, and the first time we decided to use it was simply to reach the people on the site. We did a $1000 raise but it was not necessary for us at the time. We used it as more of a promotional tool. Q: From a merchant's point of view, what are the advantages and disadvantages of Kickfurther financing vs conventional financing? A: The advantage is the quickness of the system. We needed this last raise in a hurry to get the product we needed to maximize sales. A bank or even an online lender would not be quick enough for us to get our product in time and that was the benefit for us. It was the only option we had to get our down payment for this shipment on time. A: Yes, if it fits your circumstances as it did with ours. More traditional methods can have much lower return rates, but if you do not have the time or cannot get the financing that you need, it is a great option. That have a very professional team that works with you also, and I was very impressed. A: I have not, but I use all of my working capital for Vaportini. I would in the future as my business grows and if I have more personal money to play around with. Q: Anything else you'd like to tell us? A: Just for all the entrepreneurs out there, to always focus on the future and the positives. There will always be ups and downs when starting business and just focus on the best decisions you can make and learn from the bad decisions but don't dwell on them. We made of a lot of mistakes the first year in business when we were learning, and we don't make the same mistakes at this point, and things are humming along. I'd like to thank Jack for visiting with us today. For those who do not read this blog regularly, start! I write regularly about Kickfurther, a website on which ordinary investors can crowd-fund inventory purchases for businesses, like Vaportini. Kickfurther investors purchased a certain number of those units Vaportini ordered, and then returned them to Vaportini for Jack and his company to sell on consignment. When the units sell, Vaportini pays us back. 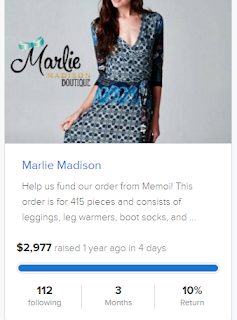 For their trial run, they raised $1038.90 and repaid investors in less than a month. The reason they paid back so quickly is that Kickfurther does not allow companies to finance another order until the first order has been paid. Those who were in on the first investment did well--they received a profit of 5% of their investment, and that is not 5% per annum. Since I invested in Vaportini's second raise, I hope they are selling a whole lot of those units. Another advantage to businesses of Kickfurther financing over conventional loans is that no payments are due while the inventory is being produced. Kickfurther investors (like me) get paid when inventory sells. Hopefully, by the end of the month, I will have my 9% profit in my account. If Kickfurther sounds like a good investment to you (and please check out my other posts and other information about Kickfurther before making that decision), you can click here and get a $5.00 credit on your initial investment. (unless Kickfurther has changed that, and I have no control over them). If you are an entrepreneur and need money for tangible inventory, click on this link, and if you use Kickfurther, I get a referral fee. You can buy a Vaportini in my Kickfurther Store and I get a commission, or you can go to Vaportini's website. Welcome to Financially Savvy Saturdays, the savviest personal finance blog hop on the planet, created specifically for personal finance writers! We welcome all things money here. Whether you've written anything from how you've set yourself a new money saving challenge to how you recently taught your best friend to be frugal, you're invited to link-up. If it ties into personal finance, we want to read it! This weekend we're excited to welcome back Ruth Ann from Racing Towards Retirement, where she writes about, you guessed it, life closer to retirement and how to prepare for that next step in life. Tweet about it. You can use #finsavsat when tweeting about the party! Concerns about SEO? Recently many bloggers have decided to stop participating in events such as Carnivals. If you're worried about how participating in this link-up could effect your SEO, I'd encourage you to check out this article. Interested in co-hosting? Co-hosting is fun AND easy. If you’re interested, you can email us via brokeGIRLrich(at)gmail(dot)com or info(at)diseasecalleddebt(dot)com with any questions. Or if you're ready to take the plunge, you can sign up on this Google doc. If you’ve co-hosted before and enjoyed it, please consider doing it again! If you’re interested but nervous about getting involved, please email one of us, we love talking to new bloggers and would enjoy explaining how blog hops work and getting you more involved! Click here to read this great post! If you submit a post, you could be featured in next week's party! We do have a couple of rules for participation. Those who don't follow the rules will have their link taken down. 1. Your post must be written in the past seven days, related to personal finance and not be solely a giveaway. 2. Be sure to include a link to one of your hosts by copying and pasting the html in one of the boxes below into your linked up post. You have the option of the button or a text link. 3. Follow your hosts. You can follow brokeGIRLrich on Google+, Facebook, Twitter, Pinterest, OR by subscribing to her RSS feed and A Disease Called Debt on Google+, Facebook, Twitter, Pinterest, OR by subscribing to her RSS feed. Also, you can follow Racing Towards Retirement on Twitter, Pinterest OR Bloglovin. 4. Comment on at least one post before and after you that have joined the party. 5. HAVE FUN! In April I received the bulk of my inheritance (I had gotten a nice chunk in 2014, which I put into my 401K). We kept about $20,000 of my inheritance in our savings account and disbursed most of the rest of it to various investments. We also spent a little over $20,000 of it renovating our bathrooms. Unplanned expenses in 2015 included a new refrigerator (about $900) and a new dishwasher (about $500 and we hate it). Our vacation this year was a week at a friend's beach house, so while we ate out and went places, we didn't spend much on lodging. My pay has been flat; my husband's is up a couple of thousand dollars. We were able to meet current expenses out of our checkbook except for tuition/room/board for my girls. Those bills total about $10,000 a year and we had to pull about $5,000 from our savings to pay for it. On the savings front, besides what we did with my inheritance, we were able to save about 11% of my pay and about 5% of my husband's pay (we make about the same) in our 401Ks. My firm gives me 5% of my salary in my husband gets 3% of his pay, so about 12% of our combined pay ended up in our 401Ks. Lending Club: We earned $1603.61 from Lending Club this year. Here are some charts that show how I am doing, at least with the notes I purchased new on the platform. However, I also purchased a bunch of resale notes, hoping they would be safer, less likely to default. I was wrong and won't be doing that anymore. You can click on the photos to see them better, but the chart above shows that without adjusting the value of the account for notes that are currently late, but which have not defaulted, I have an annualized return of 12.68%, and that the weighted average interest rate on the notes in my portfolio is 16% The bright blue dot is me; the red dots are people with portfolios like mine and the blue dots are other Lending Club investors. You can see I'm in the middle of the pack; not the best, not the worst. You can also see that it is likely that as my portfolio ages, my returns will fall. This chart is adjusted for past due notes. It shows me doing somewhat better as compared to my peers and it shows that the big decrease in value has likely already happened, though again, as the portfolio ages, I can expect further drops. This chart shows my likely annualized return on those notes to be 9.39%. You can see that on my overall portfolio, I am averaging 13.21%. This is less than on my seasoned notes because my first notes were higher risk notes; my last big infusion of cash was almost all in A and B notes and it was in March, less than ten months ago. 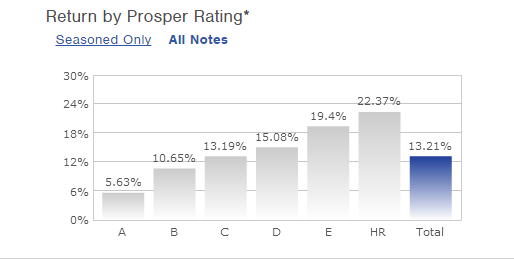 On the left you can see the breakdown of my Prosper account across note grades. You can also see my seasoned return. This year I made $1,621.41 from Prosper. Motif: Over the course of the year I invested $7,000 in eight different "Motifs" or groups of stocks. I collected $74.09 in dividends and as of 12/31 the account was worth $7,104.29. so I gained a little too. If you want to look them up, the Motifs in which I have invested are "Things I Like", "Low Beta", "Growing Dividends", "High-Yield Dividends", "Buyback Leaders", "Cyber Security" "Online Gaming World" and "Online Video". My winners are "Growing Dividends" which is up 2.5% since I bought it, compared to the S&P 500, which is up 1.6% in that time; and "Online Gaming World" which is up 23.7% since I bought it, as opposed to the S&P, which is down 3.3% in that time. If you'd like to try your hand with Motif, use this link. If you invest $1,000, we both get $100. HD Vest into Vanguard: This is the money we had invested with a financial adviser. It consisted of three accounts: my IRA, my husband's IRA and a taxable account. At one point late in 2015, all our investments were in the black, except these accounts. They threw off earnings every month but then every three months most of those earnings would be eaten up by fees. We decided to take our money over to Vanguard, and in doing so, learned of yet more fees--HD Vest wanted $95.00 per account to terminate the accounts and transfer the securities. Once we got the money over to Vanguard, we wanted to sell the funds HD Vest put us in as they had us in about twenty different mutual funds and keeping up with them was just more work than I wanted. We learned that it was going to cost us $20 per fund per account to sell them all (and it would have cost the same had we sold them before the transfer). We decided to keep those funds that were meeting or beating their benchmarks and to funnel our dividends and capital gains into Vanguard index funds. We'll keep watching the others, but I hate to spend $20 to sell $1000 worth of an adequate mutual fund. All in all, our foray with HD Vest and our financial adviser proved to be very expensive. This year our total fees on these three accounts were $3851.56. Our total loss was $12, 565.71. Roth IRAs invested in Vanguard's S&P 500 Index fund: Both my husband and I have Roth IRAs with Vanguard. We deposited $14,000 into these accounts over the course of the year. The accounts paid $1176.50 in dividends and capital gains, but over the course of the year lost $634.49. My 401K: This is invested 75% in stock mutual funds and 25% in a bond fund. I re-balance monthly and invest 8% of my pay, and my company kicks in 5%. For the first half of the year I invested more. This account actually gained 0.42%. Capital gains and dividends were $15,737.16 and fees were $6.16. My husband's 401K: This is invested in a couple of AXA annuity funds whose ticker symbols don't work online. Like everyone else, he lost money this year, about 5%. 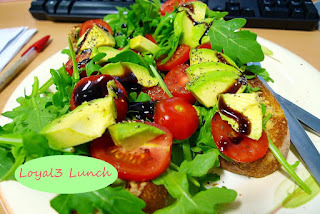 Loyal 3: This is my "Loyal3 Lunch" portofolio. As of 12/31 it was worth $152.07, meaning it had lost $2.93. Kickfurther: I've invested $2686.09 and I've earned $70. I have three offers which have paid either nothing or close to it and one that has paid half and really doesn't seem capable of paying more. Kickfurther's agreements with vendors say that if the vendor is unable to sell the merchandise, they are not obligated to repay investors; instead Kickfurther repossesses the merchandise and attempts to sell it to make investors whole. Because Kickfurther is a new platform, they have just gotten to the point that they are repossessing products. So far, Kickfurther has offered by buy out all the deals that have gone bad. I've taken them up on it, so while I haven't gained anything on those deals, I haven't lost either. I'm sure that it won't be long before investors have to bear their own losses, but for now, I've gotten to keep my profits and give away my losses. Annualized, my returns are over 30%. I'm not going to share all my numbers with you for privacy reasons. However, I will tell you that all totaled, our investments lost $7,188 last year. Think twice, or three times before hiring a financial adviser on an "Assets Under Management" scheme. If you don't want to watch your investments and re-adjust them for market conditions, aging etc., invest in a Target Date fund and call it good. We wouldn't have gotten rich this year in any case, but adding another $5,000 to our income sure wouldn't have hurt. This week's Kickfurther Merchant of the Week is GameFaceGear and I'm interviewing their managing partner, Doug Niedrich. Q: Doug, can you tell me a little about how your company started and how it has grown over the years? A: A friend of mine who was a life-long hunter came to me with an idea to help bow hunters cover up easily. I saw ways to improve and expand on his idea so we put our heads together.... I mortgaged my house, we filed patents, formed a company, flew to Vietnam to source world-class headwear manufacturing, obtained key Camo licenses and hit the trade show circuit with no idea what to expect. We sold $48,000 worth of units our first year. Q: Is GameFaceGear the company and QuickCamo the brand? Q: I'll admit I'm not a hunter, but I've never seen hunting masks before; are they common products or your original idea? A: There are lots of camo hats/masks out there; however, QuikCamo’s patent-pending designs are unique. There is nothing like the QuikCamo Rear model where you turn the hat around backward to cover up, as it also keeps the bow string from hitting the bill when you are at full draw. Q: If I want hunting headgear that hides me from my prey, do I have lots of choices or are you the only game in town? If I have lots of choices, why should I buy yours? A: What separates QuikCamo from the competition is “one hand deployment”, ease of use, convenience and scent control. No more messy face paint or fumbling around with a traditional mask. You never have to put your bow or gun down to get covered up. QuikCamo is ready when you are and there when you need it. For non-hunters QC is great for air soft, bird watching or a unique Halloween mask. Internationally famous birding expert James Currie loves his QuikCamo for getting close to wildlife undetected. A: An enthusiastic college student named Jake called me and pitched the model and I liked the idea of backers with “skin in the game” helping promote a product they had faith in helping me with branding via their social media channels. A: Advantage seems to be the quick turn around of funds while getting some marketing exposure. If a company needs cash I don’t see any disadvantages. A: Yes; however learn how to engage your backers as it seems they could really help promote the brand. Q: Do you think that using Kickfurther has been successful from a marketing perspective? I have your masks in my Kickfurther store; do you know how many other people do? A: I do not know of any other backers that have my product I their stores. Q: Have you had any sales? Q: Of course, I guess getting your name and product splashed to all the Kickfurther investors when you made your offer, and available to anyone who looks at the Kickfurther site is worth something. Is there anything you were hoping for, or expecting from a marketing perspective that you did not get? A: I have not but will probably give that a whirl in the future. A: I love innovators and innovation and Kick Further is loaded with both. I have recently applied for some sports licensing approvals so anyone interested may see some up coming opportunity in that space. I'd like to thank Doug for visiting with us today. You can see his company's products on Amazon (and if you purchase from that link, or by clicking on the photos in this post, I get a commission) and on the company website. They are also in my Kickfurther Store. If you haven't been following this series, I'm trying to break my habit of eating out at lunch for no good reason. Each day I bring my lunch gives me $5.00 to invest in stock with Loyal3, an online commission-free broker. This week I brought my lunch four of five days; this morning I was rushing out of the house so we could stop on the way to school and buy glue. I decided on Intel this week. Sometime this week in surfing across the web I saw an article recommending it, and the article made sense (and unfortunately I didn't bookmark it). You note the highly technical analysis of why I think this is a great stock. I've been reading a bunch of investor blogs trying to get a handle on the lingo, and figure out what I should be looking for in all those numbers. However, for me, this portfolio is a toy; instead of buying shoes I don't need I buy stock I don't need (and which I hope makes money for me). I do not recommend that anyone use such an approach when investing large sums of money (whatever "large" is to you). For most people, retirement is a time of more time and less money. 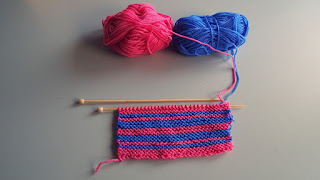 Now that you finally have time to engage in all those hobbies you put off over the years, you have less money to spend on them Hopefully this post will give you ideas to support your hobbies. If your hobby produces things people enjoy having, let friends and family know that you are willing to "work" for materials. If your hobby is needlework, perhaps a friend who is expecting a grandchild would love for you to stitch a piece for the nursery, and would consider the cost of the materials to be a bargain. If gourmet cooking is your thing, give someone a shopping list, and prepare a meal at their house, or invite them to yours--a win-win. Many people with gardens end up with far more produce than they can use at some point, and many give it away. Ask the recipients of your largess to help pay for your expenses. If crafting is your thing, look into getting a booth at a craft fair periodically. The trick is to take on only as much as you can handle without it becoming work. Is knitting your thing? Would your local craft shop pay you to teach once a week? Think about what you like to do and think about where you could give lessons. Perhaps your local community education program is looking for teachers, or the local store that sells supplies for your hobby. Can you trade golf lessons for green fees? I know this is going to shock you, but most bloggers do not get rich from it. However, depending on your hobby, a blog could do a lot to support it. 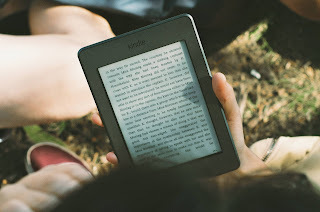 Book bloggers gain access to Advanced Reader Copies, which can be either physical books or digital. NetGalley and Edelweiss keep my Kindle full, and all I have to do is post reviews on my book blog, This That and the Other Thing. I get monthly mailings from Litfuse which offer me physical books. Catholic Word and Pauline Media send me pretty much any book they sell that I request. Most experienced book bloggers find themselves with daily offers of free books in return for a review. While Advanced Reader Copies are not supposed to be resold, and digital copies cannot be resold, it is easy for a book blogger to end up with piles of books which can be resold if desired. Check out It's Monday What Are You Reading, Mailbox Monday or The Sunday Post to become familiar with book blogs and the wide variety of review copies bloggers obtain. While other niches may not have the steady supply of review material that book blogs do, blogs that attract a readership can sell ad space, write sponsored posts, host giveaways and make money from AdSense or other advertising programs. As far as blogging goes, my advice is different from what most people writing "how to blog" posts say. If you are blogging about your hobby (as opposed to blogging as a hobby) hoping to attract enough readership to get review copies and make a few dollars via affiliate links or Adsense, I suggest starting with a free Blogger blog. It will mark you as a not-professional blogger, but it won't cost you anything. WordPress may be more powerful (and it has tons more things you can spend money on) and your own domain name makes some people take you more seriously (or so I've heard) and is better for Search Engine Optimization, but self-hosting costs a few dollars every month and unless you attract a substantial following, you aren't going to earn that much--and you aren't going to get the following unless you really work at your blog. If your goal is to be a blogger, follow the blogger's advice on how to be a great one; if your goal is community and review copies, a free blog will work just fine. If your hobby lends itself to demonstrations, demonstrate on camera and upload the video to YouTube. If you develop a following your videos can earn you money from the ads that play before the video, or you may be asked to use and advertise certain products. I get about 4,000 pageviews a month on my book blog and about 2,000 pageviews a month here, and I earn about $4.00 per month from AdSense. I have more books than I can read, I secured a freelance writing customer and I've gotten some freebies like a nice set of mixing bowls, an Exergen thermometer, a dog toy and a grill brush. I'm a very small player in a very big world, but my blog supports my reading habit. Find blogs about your hobby and chances are good that you will find giveaways offering supplies. You can even find giveaway link-ups. Many of them are run via Rafflecopter and can offer dozens of entries if you have the patience to look at everything they want to you examine but you can find smaller giveaways with better odds of winning, though the prizes usually have a lower value as well. I've won books, holiday decor and even an electronic prayer book. 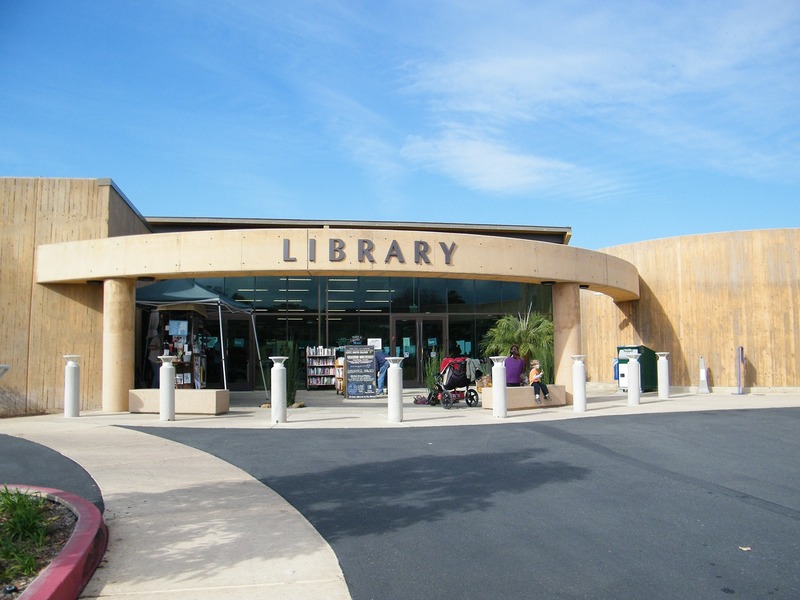 Yes, it is easy for a reader to obtain free (or shall we say paid for by taxes) books at the local library, but today's public library also offers videos, and access to a variety of databases. Instead of buying cross-stitch patterns, check books out from the library. If you want to build something, a book from the library may be able to tell you how. The library has cookbooks galore and magazines on many different topics. Instead of subscribing to Ancestry.com, go to the library and use their subscription. Whatever you enjoy, chances are that other people do too, and that still others have tried it and found it wanting. 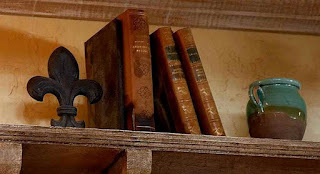 As people de-clutter, all sorts of things make their way to the garage sale or to Goodwill. I know someone for whom the hunt for quilting fabrics is almost as much fun as quilting. While most of our hobbies will never be truly free, a little creativity can make them much less expensive. What are ways you have found to save money (or maybe even make money) on your hobby? This week my Kickfurther merchant of the week is Active 10, which makes a topical analgesic cream. Darren Cohen, one of the company founders was kind enough to answer a few questions for me. Darrin has played tennis since he was five years old. In all junior age divisions Darrin was ranked in the top five in Northern California and top 30 nationally. At the University of Virginia he competed as a top six player on the varsity men’s tennis team for four years, achieving an NCAA singles ranking of #36, and a doubles ranking of #10. 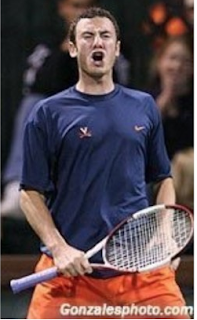 When he graduated from UVa he competed on the ATP Professional men’s tennis tour. After one year on the tour Darrin achieved a singles ranking of #1100 and a doubles ranking of #740. Q: Can you tell me a little about Active 10? What is the story behind the name? A: My partner and I founded Active Formulations in 2013. I was a professional tennis player ranked 750 in the world and had my career stop short due to nagging tennis elbow. My business partner and I were on the court one day and she was telling me about a few supplements that she manufactured and I suggested that she and I develop a tennis elbow cream. Over the course of the next year and half we worked with a chemist and manufacturer in Florida developing Active 10. The name is derived from the number of active ingredients we use to treat localized pain. We have since added one, but have stuck with the original name. Q: I see on Amazon that you have four different products. What are they, and what are the similarities and differences? How do I decide which one to order for my problem? A: We really only have one product at the moment. We sell Active 10 in a 2oz jar, a 3oz roll on container, and a 4oz tube. We also market our product to tennis pro shops and country clubs and call it Tennis Elbow Grease. Nearly half of all tennis players at some point will have tennis elbow so we are trying to appeal to that niche segment. As far as ordering, typically our customers start with a 2oz jar and once they figure out that what we are selling is a really high quality formulation that actually works will reorder our larger sizes. Q: For someone applying daily, how long does one package of your product generally last? A: The 2oz jar will last approximately 1 month with daily use. Q: I see on your website that Active 10 is sold at tennis clubs and chiropractors' offices. Do you have any requirements for those who carry your product or will you allow any retail outlet to do so? A: We wholesale our product to verified vendors. We like to research our accounts to make sure we are partnering with organizations that will represent our brand as a first class product. A: They approached us a few months back after they had heard about our product on social media. We were right in the middle of a major production run and figured we could use the help in funding half of the order. Q: You are in the payback phase of your first Kickfurther offer. From a merchant's point of view, what are the advantages and disadvantages of Kickfurther financing vs conventional financing? A: The advantage to using Kickfurther is it was very little paperwork or background checks, and an extremely fast turnaround time. Essentially they just use the inventory as collateral. The disadvantages are obviously the really steep interest rates. We were sold a pitch about how the investors would help us to sell product, but that didn't actually happen. Q: Well, I'm trying. Would you recommend Kickfurther to other businesses? Why or why not? A. I think its a really easy way to secure a little bit of money to help with production runs but in the long run its not really a viable business option. Margins are too thin to be paying 20% apr on money borrowed. So to answer the question, its a great way to get started but companies will need different sources of money at much cheaper rates to survive long term. A: I have used the site as an investor and feel its a really great way to earn excellent returns. I have recommended it to my friends as well. Returns are so high, I've seen the site crash because investors are clamoring to lend money at insanely high interest rates. Q: Yes, I was on that day too, I have notice though that especially with second offers that rates seem to be trending downward. Of course the reason for the high interest rate on Kickfurther offers, or on loans from other sources is to cover the losses from companies that default. A: Active 10 is the topical pain relief solution of choice of the Dallas Cowboys and Kansas State University athletic training rooms. We also have verbal commitments from Safeway and Lucky Grocery store to carry Active 10 in 2016. I'd like to thank Darren for visiting with us here today. The product photos above are all Amazon links; I get a small commission if you use those links to purchase Active 10. I am also a backer of Active 10 on Kickfurther so when they sell, I get paid. Active 10 is a link to an Amazon page showing all their different packages. Active 10's website is here. If you would like to get in on the high returns Darren spoke about, you can use my referral link, and I get credit. You get $5.00 toward your first investment. If you have a business that needs help financing inventory, you can use this link and I get a finder's fee.